This thing defies logic. The engineering lobe in my brain, the one that has been conditioned by years of analyzing all sorts of bizarre creations, claims after a while that this thing just can't be built. Yet here I am, in front of a midget sized 1100 Guzzi engined scoot that's short, compressed and tall, the exact inverted image of my Le-Mans III. Standing next to the Ghezzi & Brian Furia, my old 850 looks as long as a stretch limo and low as a genuine Arlen Ness job. Guess Ill just have to ask Giusseppe (the Ghezzi half of the equation) how he managed to stuff a 35 year old, longitudinal crank, tractor's engine into a 55.3" wheelbase, a figure that is closer to R1 or Fireblade territory, than it is to a Mandello product. It's not just the sheer tiny-ness of this bike that wins me over. Me thinks that even regular, non-Guzzisti types, cannot help but be impressed by the Furia's visual impact. It's a bit of a two-wheeled Frankenstein from some angles, with so many mechanical components seemingly competing for your attention. But unlike the stitched together, unattractive creature of Mary Shely's book, The Furia is a beautiful monster, harmonious even from some angles, menacing from others. Then there is the issue of the sheer quality of most everything you see on the Furia. There is no bracket that hasn't been carefully designed or weld line that isn't plain artful. 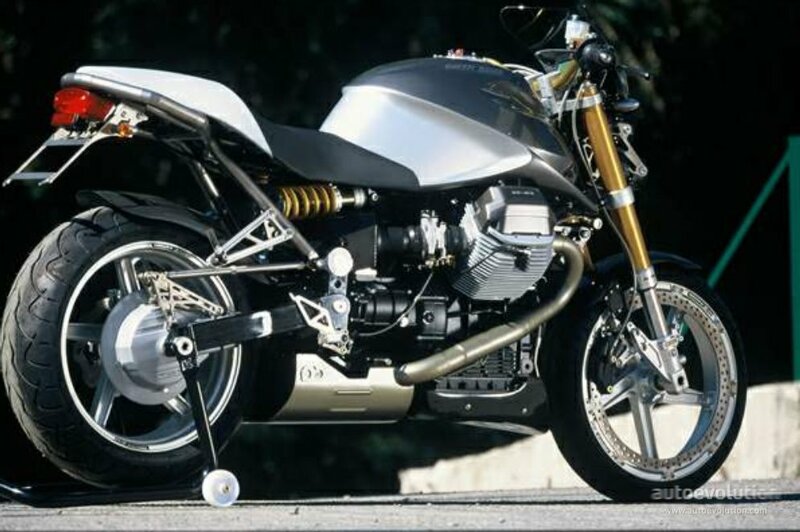 Some may say, "An Italian Buell" and conceptually they won't be far from the truth. It's just that instead of a V-Twin that's hiding behind a bread box sized air filter or fat twin spars, the Furia has that double sided eternal erection with those two towering cylinders sticking out almost disproportionately. What a sight! This is the second time that I'm visiting this small venture and it's hard not to notice all the hard work these guys have done, in the year and a half since my last trip. First of all, they've moved into new and much larger premises and the "production line" (about four bike lifts...) doesn't share space anymore with a dental equipment warehouse. 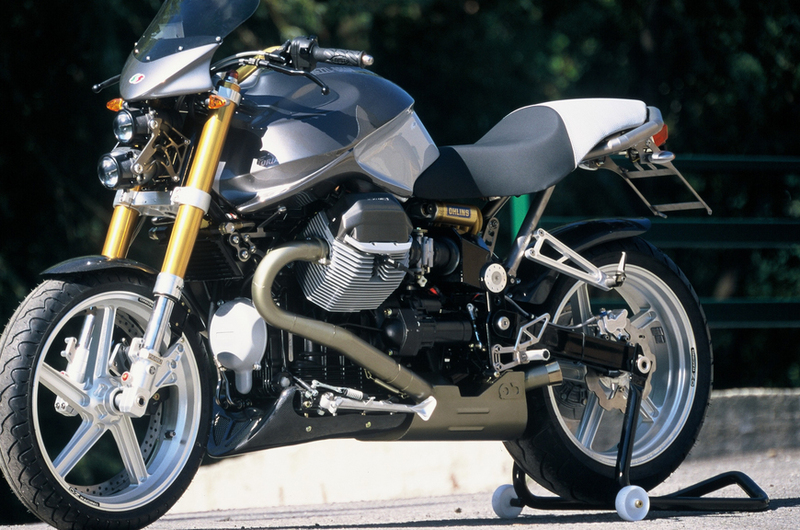 In fact, the smart and creative engineering solutions in the Sport-Twin I tested back then, have caught the eyes of Guzzi's management and the development of the breath taking, MGS 01 racer was entrusted to Ghezzi & Brian. Beside this dream task and moving the factory, time was also found to widen the model lineup. Even though the whole Ghezzi & Brian thing started with racing, via the Super-Twin, there can be no denying the growth in the naked bike sector, at least in Europe. With such a photogenic engine under their hands, putting together a less focused, more all-round and usable machine was the way to go. 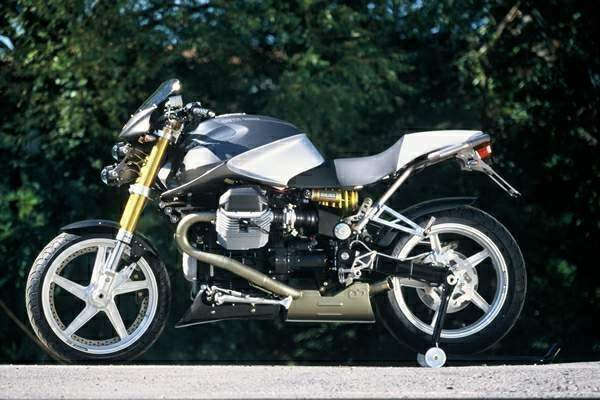 The mechanical side of things is still based on the race-winning frame that took their Guzzi powered creation to an Air-Cooled Twins Italian championship, back in 1996. Just to remind you, the frame developed by Giusseppe Ghezzi is based on a single, hefty sized, rectangular spar that connects the steering head to the rear of the box, not unlike the famous one built by Dr. John. The difference is that in the G&B bikes, that massive tube serves also as a huge air-box, tunneling fresh and cool air picked up at the front directly to the throttle bodies, thus feeding the engine with denser air that has not been heated up by the cooling fins. Another clever feature of the G&B frame is that unlike the V11, it has a progressive linkage, thus curing a definite problem in the rear suspension of standard Guzzis (It has to be added that the new 1100 Breva finally got a progressive linkage too). That still doesn't really explain how it is, that the Furia is so light, while housing that tractor engine, 407lbs. to be exact. Pay close attention and you'll see that this thing has absolutely no flab flapping around and all the tasty components were chosen with weight savings in mind. Rim mounted front disks, a waved rear one, forged OZ racing rims, and an aluminum gas tank (under a shaped cover). A short stab of the starter and the Furia settles into a well injected idle that's accompanied by typical Guzzi Rockin' & Rollin'. While the engine warms up down there, the compactness of the whole machine and its riding position are immediately felt. The long and low bars of the Super Twin immediately contorted my 6'4" into a Kamasutra position worthy of a bachelor of the Ashram of Puna. The Furia on the other hand, sets you in an aggressive and erect streetfighting position. Clutch in, first gear up, release and... mmm the thing hardly moves! Yes, I am in first, it's just that first gear is waaaay tall, more like pulling away in second. Like the Super Twin, the Furia is equipped with the California wide spaced 5 gear box and as it would turn out, my bike was also equipped with the tall gearing option. A few more standing starts and I got used to it but as it would turn out, the long geared Furia required spinning the engine more than necessary for a torquey twin just to fill the huge gaps between gears in the twisty Alpine roads I rode on. Yet even with the tall gearing, the moment the clutch lever is full released and with the engine above 2500, the Furia starts to strut her stuff. There is a huge pool of torque here and the EFI is faultless, so as the old geezers say, it's the area under the torque curve that counts, not the peak value! There might be only about 80 rwhp here but the Furia accelerates strongly and climbs up easily to 8K. OK, the old Guzzi mill in its latest incarnation as an 1100 is a sweet and character laden thing and that's a known quality. It changes direction with an uncanny light effort at the bars.What is totally un-Guzzi like, is the handling manners of this thing! It changes direction with an uncanny light effort at the bars. With 600-like 23 degrees of rake and 90mm of trail and wide / tall handlebars, this thing is fun to throw around and zigzag about on, even before the going gets really twisty. The "right kind of fun" on a naked, begins in proper at the mountains surrounding Missaglia, G&B's home town, a place where you can instantly feel as if you're in a Playstation game, while toying around between 40 and 70 mph. In this environment, the Furia shows its love for the tight and quick, either laying hard on it side or changing direction rapidly. Doesn't matter at which rate you dial in your lean angle, this creature doesn't seem to mind that down there is a small lead lump in the shape of a big block Guzzi. Raising the pressure doesn't faze the Furia either; trail braking into turns doesn't result in any standing up. But these extremely quick manners and the very upright steering angle, that's more suited to a clip-on equipped bike, do carry a price. Feedback from the front was lacking a bit at extreme lean angles and once or twice, I felt the front starting to step away. To put it shortly, the Furia's front end is surgeon scalpel sharp, so don't be surprised if you get gashed; this is no user-friendly tool for beginners or even mid level riders. While testing the sporty Super Twin more than a year ago, I was less than impressed by the cool rim mounted disks. Good looking but lacking in feel. Thanks to what felt like new compound pads, the brakes of the Furia felt much more powerful and sensitive and my only complaint was some inconsistency in the brake lever's free play. Another notable item was the excellent rear suspension that unlike the one in the V11, really lets the Öhlins shock shine. Both ends are calibrated on the sporty rather than comfy side of things, the payoff being the utter control while carving hard. Without me even noticing, this test day is getting long. I've already been riding for a few hours, some of the time with my dear photographer on the back seat, yet comfort is actually good even for a long legged rider on such a short bike. It's at least as comfy as a Ducati Monster is and the back seat is way better than the joke on the V11, a bike that's supposed to be more touring oriented to begin with. The seat might look small but it's well padded and the funky looking cover material really holds you in place. The only thing to spoil my fun in the mountains was the limited lock to lock angle. While trying to zigzag between two stuck cars it almost caught me out. For a bike that is well suited to city dwelling and showing-off the steering angle is ridiculously small. On the way back to the factory, I take a nearby autostrada, to see what she'll do on more flowing tarmac. The Furia has no trouble climbing up to 120 and a 100-mph cruise speed is quite realistic. At those speeds, the Furia still invites you to attack sweepers and the extreme chassis parameters do not make the Furia nervous. It actually remains very confidence inspiring at high speeds, something I cannot say about all naked mounts I've tested. Riders accustomed to faired bikes will of course complain about the lack of wind protection, but that misses the point of the whole naked experience, doesn't it? Those more accustomed to the naked theme will appreciate the effectiveness of the small screen that splits the air down low without creating much annoying turbulence. What did annoy me on the open road, was the ultra long gearing. An unscientific check showed that at 60mph the engine is idling at a lowly 3200 rpm! With this sort of gearing, fifth becomes a serious overdrive. Interestingly enough, my colleagues at the Italian Motociclismo magazine didn't find any gearing problem with the bike they tested. Turns out that you can order your Furia with a lower gearing option. Be sure to do so. At the end of the day, I was left with mixed impressions. The long gearing is totally out of place on a streetfighter, but that can be remedied at the factory. Then there are those toy like instruments, that do no fit the quality of the whole bike and having to open two fuel tank caps (one for the outer cover, one for the aluminum tank), is typical small production run stuff. But leaving these nuisances aside, the concept of a naked and aggressive model fits the good old Guzzi mill and Giussepe's magic frame to a T.
The handling is superbly modern, extreme even, making that engine feel 30 years younger but doesn't prevent the Furia from being a multi use bike. An exotic piece that should satisfy any Guzzisti's need for exclusivity and showoff value while supplying daily service, inclined fun on the weekends and even a discreet touring capacity. Taking into account the quality of the craftsmanship on that hand welded frame, the exquisite details (look at those passenger footpeg hangers) and the exotic componentry, the 17,000 Euro asking price is even reasonable.